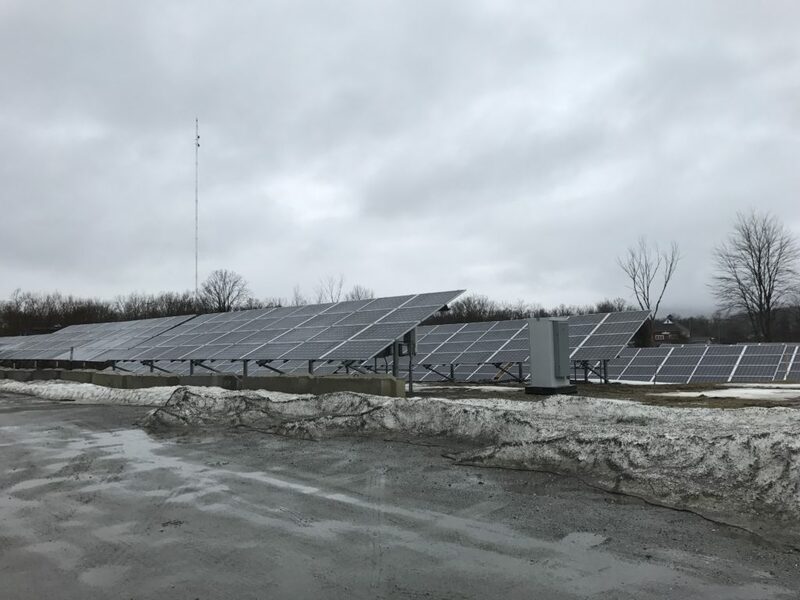 These solar panels next to Barrington Brewery in Great Barrington provide the energy to operate a complex of businesses. Similarly, HeatSmart Mass is offering homeowners a method of heating their houses using sustainable energy techniques. Great Barrington is one of four community grantees statewide selected to participate in the first round of HeatSmart Mass – a community-based education and group purchasing program for clean heating and cooling technologies. A joint initiative of the Mass. Department of Energy Resources (DOER) and Massachusetts Clean Energy Center (MassCEC), HeatSmart Mass aims to save residents money and slash emissions from the heating/cooling sector. Air source heat pumps offer efficient heating at lower cost. The program is modeled after the successful Solarize Mass program. HeatSmart simply takes the same community outreach and group purchasing model from Solarize and applies it to clean heating and cooling technologies – including air-source heat pumps, ground-source heat pumps, modern wood heating, and solar hot water. The pilot grant recipients were announced November 15th. Great Barrington is the smallest community selected and the only one located west of the Boston metro area. The other communities selected are Bolton, Carlisle, Concord, Harvard, Lincoln, and Nantucket. Great Barrington recently approved a municipal aggregation contract for electricity that offers residents and businesses the option to purchase clean energy at a lower cost. Through that contract, the electricity supply comes entirely from wind power. Now, that green electricity can go towards powering the renewable heating-cooling technology that the town selected for HeatSmart. Great Barrington will use its $9,000 HeatSmart grant towards community education and outreach for air-source heat pumps. This is a modern, highly efficient heating-cooling technology that uses indoor-outdoor air exchange to heat and cool your house. Since air-source heat pumps are one of the most energy-efficient heating technologies available today, the potential for energy savings – and thus lower utility bills – is significant. According to the Northeast Energy Efficiency Partnerships, annual savings are about 3,000kWh (or $459) compared to electric resistance heating, and 6,200kWh (or $948) compared to oil heating. After converting to solar energy Andrew Mankin and Gary Happ, owners of Barrington Brewery, symbolically cut the power cord with which they relied upon traditional energy sources. Massachusetts already ranks number one out of all states in the country for energy efficiency due in large part to the Mass Save program, which offers no-cost energy assessments and a range of other rebates, incentives and services geared towards energy efficiency. For residents – especially those in lower income brackets – who are considering switching to a cleaner heating source, the no-cost assessment is a game-changer. “Our secret weapon is not heat pumps. It’s Mass Save,” said Michael Feldstein, the HeatSmart “coach” for Great Barrington. He explained that Great Barrington’s HeatSmart team plans to prioritize outreach to low-income residents, and that the program is designed with inclusivity and socio-economic justice in mind. “Part of our social responsibility is to make sure there isn’t a ‘green divide’ in terms of affordability,” he said. According to MassCEC, 71 percent of households in Great Barrington use high-cost heating fuels – electric baseboard, oil, or propane. Air-source heat pumps are less expensive than any of these three heating methods. According to an Edge news brief, Great Barrington will work with partner organizations the Great Barrington Senior Center, Construct, Volunteers in Medicine Berkshires, the Guthrie Center, Berkshire Center for Justice, and Greenagers to educate residents on financial aid programs that would help defray the costs of switching to more environmentally friendly heating sources. “I am thrilled to learn that Great Barrington is participating in this program. Bringing air-source heat pumps to town will not only reduce greenhouse gas emissions and improve local air quality, it will help folks save money,” said State Representative William Pignatelli (D-Lenox), House Chair of the Joint Committee on Environment, Natural Resources and Agriculture. Feldstein said his team is actively recruiting volunteers to help with outreach for the program. He hopes to build a model that can be replicated throughout the county.